Yazoo City Town Hall Meeting Please join the City of Yazoo City to discuss the future of Yazoo City with Mayor Diane Delaware and fellow citizens. 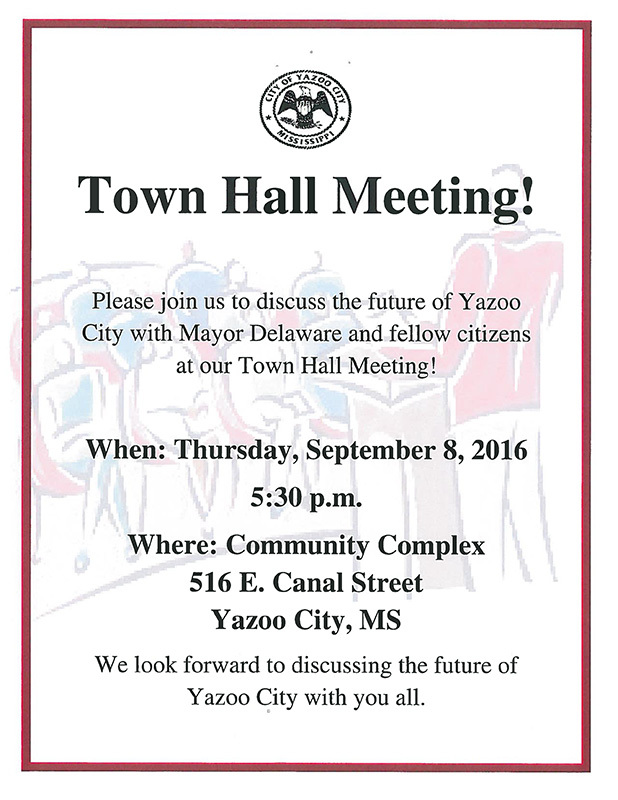 Thursday, September 8, 2016 5:30 p.m. Yazoo City Community Complex 516 E Canal Street Yazoo City, MS 39194 The City of Yazoo City looks forward to discussing the future of Yazoo City with everyone who attends the meeting. 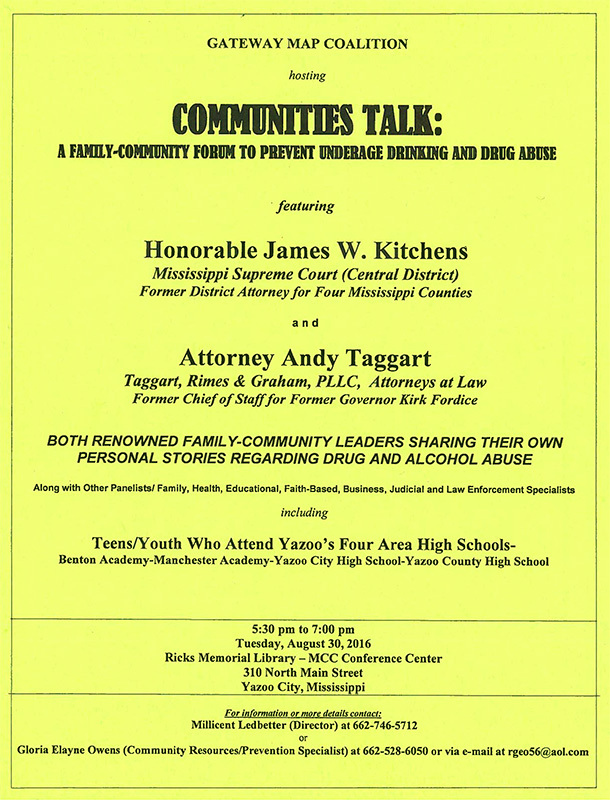 Communities Talk: A Family-Community Forum to Prevent Underage Drinking and Drug Abuse 5:30 pm to 7:00 pm Tuesday, August 30, 2016 Ricks Memorial Library – MCC Conference Center 310 North Main Street Hosted by Gateway MAP Coalition featuring Honorable James W. Kitchens Mississippi Supreme Court (Central District) Former District Attorney for Four Mississippi Counties and Attorney Andy Taggart Taggart, Rimes & Graham, PLLC, Attorneys at Law Former Chief of Staff for Former Governor Kirk Fordice BOTH RENOWNED FAMILY-COMMUNITY LEADERS SHARING THEIR OWN PERSONAL STORIES REGARDING DRUG AND ALCOHOL ABUSE Along with Other Panelists/ Family, Health, Educational, Faith-Based, Business, Judicial and Law Enforcement Specialists including Teens/Youth Who Attend Yazoo’s Four Area High Schools- Benton Academy-Manchester Academy-Yazoo City High School-Yazoo County High School For information or more details, contact Millicent Ledbetter (Director) at 662-746-5712 or Gloria Elayne Owens (Community Resources/Prevention Specialist) at 662-528-6050.